The CompilerInstance serves two purposes: (1) It manages the various objects which are necessary to run the compiler, for example the preprocessor, the target information, and the AST context. 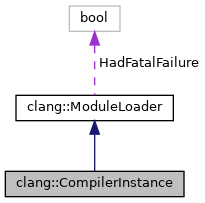 (2) It provides utility routines for constructing and manipulating the common Clang objects. The compiler instance generally owns the instance of all the objects that it manages. However, clients can still share objects by manually setting the object and retaking ownership prior to destroying the CompilerInstance. The compiler instance is intended to simplify clients, but not to lock them in to the compiler instance for everything. When possible, utility functions come in two forms; a short form that reuses the CompilerInstance objects, and a long form that takes explicit instances of any required objects. Definition at line 72 of file CompilerInstance.h. Definition at line 59 of file CompilerInstance.cpp. Definition at line 68 of file CompilerInstance.cpp. Definition at line 797 of file CompilerInstance.h. addOutputFile - Add an output file onto the list of tracked output files. OutFile - The output file info. Definition at line 625 of file CompilerInstance.cpp. clearOutputFiles - Clear the output file list. The underlying output streams must have been closed beforehand. EraseFiles - If true, attempt to erase the files from disk. Definition at line 629 of file CompilerInstance.cpp. Referenced by clang::FrontendAction::BeginSourceFile(), and clang::FrontendAction::EndSourceFile(). Definition at line 470 of file CompilerInstance.cpp. References getAuxTarget(), clang::Preprocessor::getBuiltinInfo(), clang::Preprocessor::getIdentifierTable(), getLangOpts(), getPreprocessor(), clang::Preprocessor::getSelectorTable(), clang::Preprocessor::getSourceManager(), getTarget(), and setASTContext(). Referenced by clang::FrontendAction::BeginSourceFile(), and createModuleManager(). Create a code completion consumer using the invocation; note that this will cause the source manager to truncate the input source file at the completion point. Definition at line 573 of file CompilerInstance.cpp. References clang::FrontendOptions::CodeCompletionAt, clang::ParsedSourceLocation::Column, EnableCodeCompletion(), clang::ParsedSourceLocation::FileName, getFrontendOpts(), getPreprocessor(), clang::ParsedSourceLocation::Line, and setCodeCompletionConsumer(). Create a code completion consumer to print code completion results, at Filename, Line, and Column, to the given output stream OS. Definition at line 599 of file CompilerInstance.cpp. Create the default output file (from the invocation's options) and add it to the list of tracked output files. The files created by this function always use temporary files to write to their result (that is, the data is written to a temporary file which will atomically replace the target output on success). Definition at line 661 of file CompilerInstance.cpp. Referenced by clang::RewriteIncludesAction::BeginSourceFileAction(), clang::HTMLPrintAction::CreateASTConsumer(), clang::ASTPrintAction::CreateASTConsumer(), clang::RewriteObjCAction::CreateASTConsumer(), clang::GenerateModuleAction::CreateASTConsumer(), clang::RewriteMacrosAction::ExecuteAction(), clang::RewriteTestAction::ExecuteAction(), clang::PrintPreambleAction::ExecuteAction(), clang::PrintPreprocessedAction::ExecuteAction(), and GetOutputStream(). Create the diagnostics engine using the invocation's diagnostic options and replace any existing one with it. Note that this routine also replaces the diagnostic client, allocating one if one is not provided. Client If non-NULL, a diagnostic client that will be attached to (and, then, owned by) the DiagnosticsEngine inside this AST unit. ShouldOwnClient If Client is non-NULL, specifies whether the diagnostic object should take ownership of the client. Definition at line 255 of file CompilerInstance.cpp. Referenced by clang::createInvocationFromCommandLine(), clang::tooling::ClangTool::run(), and clang::tooling::FrontendActionFactory::runInvocation(). Create a DiagnosticsEngine object with a the TextDiagnosticPrinter. If no diagnostic client is provided, this creates a DiagnosticConsumer that is owned by the returned diagnostic object, if using directly the caller is responsible for releasing the returned DiagnosticsEngine's client eventually. Opts - The diagnostic options; note that the created text diagnostic object contains a reference to these options. Client If non-NULL, a diagnostic client that will be attached to (and, then, owned by) the returned DiagnosticsEngine object. CodeGenOpts If non-NULL, the code gen options in use, which may be used by some diagnostics printers (for logging purposes only). The new object on success, or null on failure. Definition at line 262 of file CompilerInstance.cpp. References clang::DiagnosticOptions::DiagnosticLogFile, clang::DiagnosticOptions::DiagnosticSerializationFile, clang::ProcessWarningOptions(), SetUpDiagnosticLog(), and SetupSerializedDiagnostics(). Create the file manager and replace any existing one with it. The new file manager on success, or null on failure. Definition at line 297 of file CompilerInstance.cpp. References clang::createVFSFromCompilerInvocation(), getDiagnostics(), getFileSystemOpts(), and getInvocation(). Create the frontend timer and replace any existing one with it. Definition at line 590 of file CompilerInstance.cpp. Definition at line 1449 of file CompilerInstance.cpp. References createASTContext(), clang::PreprocessorOptions::DisablePCHValidation, getASTConsumer(), getASTContext(), getFrontendOpts(), getHeaderSearchOpts(), getModuleCache(), getPCHContainerReader(), getPreprocessor(), getPreprocessorOpts(), getSema(), getSourceManager(), hasASTConsumer(), hasASTContext(), hasSema(), clang::HeaderSearchOptions::ModulesValidateSystemHeaders, pruneModuleCache(), clang::ASTContext::setASTMutationListener(), clang::ASTReader::setDeserializationListener(), clang::ASTContext::setExternalSource(), clang::HeaderSearchOptions::Sysroot, and clang::FrontendOptions::UseGlobalModuleIndex. Referenced by clang::FrontendAction::BeginSourceFile(), clang::RewriteIncludesAction::BeginSourceFileAction(), loadGlobalModuleIndex(), loadModule(), and makeModuleVisible(). Definition at line 668 of file CompilerInstance.cpp. Create a new output file and add it to the list of tracked output files, optionally deriving the output path name. Definition at line 673 of file CompilerInstance.cpp. References addOutputFile(), getDiagnostics(), and clang::DiagnosticsEngine::Report(). Referenced by clang::GenerateModuleAction::CreateASTConsumer(), createDefaultOutputFile(), and clang::GeneratePCHAction::CreateOutputFile(). Create a new output file, optionally deriving the output path name. If OutputPath is empty, then createOutputFile will derive an output path location as BaseInput, with any suffix removed, and Extension appended. If OutputPath is not stdout and UseTemporary is true, createOutputFile will create a new temporary file that must be renamed to OutputPath in the end. OutputPath - If given, the path to the output file. Error [out] - On failure, the error. BaseInput - If OutputPath is empty, the input path name to use for deriving the output path. Extension - The extension to use for derived output names. Binary - The mode to open the file in. UseTemporary - Create a new temporary file that must be renamed to OutputPath in the end. CreateMissingDirectories - When UseTemporary is true, create missing directories in the output path. ResultPathName [out] - If given, the result path name will be stored here on success. TempPathName [out] - If given, the temporary file path name will be stored here on success. Definition at line 696 of file CompilerInstance.cpp. Create an external AST source to read a PCH file and attach it to the AST context. Definition at line 481 of file CompilerInstance.cpp. References getASTContext(), getFrontendOpts(), getHeaderSearchOpts(), getModuleCache(), getPCHContainerReader(), getPreprocessor(), getPreprocessorOpts(), clang::Preamble, clang::PreprocessorOptions::PrecompiledPreambleBytes, and clang::FrontendOptions::UseGlobalModuleIndex. Create an external AST source to read a PCH file. - The new object on success, or null on failure. Definition at line 494 of file CompilerInstance.cpp. References clang::ASTReader::ARR_None, clang::DependencyFileGenerator::AttachToASTReader(), clang::ASTReader::ConfigurationMismatch, clang::ASTReader::Failure, clang::Preprocessor::getHeaderSearchInfo(), clang::HeaderSearch::getHeaderSearchOpts(), clang::ASTReader::HadErrors, clang::ASTReader::Missing, clang::serialization::MK_PCH, clang::serialization::MK_Preamble, clang::HeaderSearchOptions::ModulesValidateSystemHeaders, clang::ASTReader::OutOfDate, clang::ASTContext::setExternalSource(), clang::Preprocessor::setPredefines(), clang::ASTReader::Success, and clang::ASTReader::VersionMismatch. Create the preprocessor, using the invocation, file, and source managers, and replace any existing one with it. Definition at line 366 of file CompilerInstance.cpp. References addDependencyCollector(), clang::TargetInfo::adjust(), clang::ApplyHeaderSearchOptions(), clang::AttachDependencyGraphGen(), clang::AttachHeaderIncludeGen(), collectHeaderMaps(), collectIncludePCH(), collectVFSEntries(), clang::DependencyFileGenerator::CreateAndAttachToPreprocessor(), clang::PreprocessorOptions::DetailedRecord, clang::DependencyOutputOptions::DOTOutputFile, getAuxTarget(), getDependencyOutputOpts(), getDiagnostics(), getFrontendOpts(), getHeaderSearchOpts(), getHeaderSearchOptsPtr(), getLangOpts(), getPCHContainerReader(), getPreprocessorOpts(), getPreprocessorOutputOpts(), getSourceManager(), getSpecificModuleCachePath(), getTarget(), clang::DependencyOutputOptions::HeaderIncludeOutputFile, InitializeFileRemapping(), clang::InitializePreprocessor(), clang::DependencyOutputOptions::ModuleDependencyOutputDir, clang::None, clang::DependencyOutputOptions::OutputFile, clang::DependencyOutputOptions::ShowHeaderIncludes, clang::DependencyOutputOptions::ShowIncludesDest, and clang::HeaderSearchOptions::Sysroot. Create the Sema object to be used for parsing. Definition at line 612 of file CompilerInstance.cpp. References getASTConsumer(), getASTContext(), and getPreprocessor(). Create the source manager and replace any existing one with it. Definition at line 310 of file CompilerInstance.cpp. Referenced by clang::FrontendAction::BeginSourceFile(), and clang::tooling::FrontendActionFactory::runInvocation(). ExecuteAction - Execute the provided action against the compiler's CompilerInvocation object. The invocation options should be initialized. This function does not handle the '-help' or '-version' options, clients should handle those directly. The diagnostics engine should have already been created by the client. No other CompilerInstance state should have been initialized (this is an unchecked error). Clients should have initialized any LLVM target features that may be required. Clients should eventually call llvm_shutdown() upon the completion of this routine to ensure that any managed objects are properly destroyed. Note that this routine may write output to 'stderr'. Act - The action to execute. Definition at line 882 of file CompilerInstance.cpp. References clang::TargetInfo::adjust(), clang::TargetInfo::adjustTargetOptions(), clang::TargetInfo::CreateTargetInfo(), getAuxTarget(), getCodeGenOpts(), getDiagnostics(), getFrontendOpts(), getHeaderSearchOpts(), getInvocation(), getLangOpts(), getTarget(), getTargetOpts(), clang::TargetInfo::getTriple(), hasDiagnostics(), hasTarget(), normalize(), clang::TargetInfo::noSignedCharForObjCBool(), clang::FrontendAction::PrepareToExecute(), clang::frontend::RewriteObjC, setAuxTarget(), clang::TargetInfo::setAuxTarget(), and setTarget(). Referenced by clang::ExecuteCompilerInvocation(), and clang::tooling::FrontendActionFactory::runInvocation(). Definition at line 257 of file CompilerInstance.h. Referenced by clang::ento::CreateAnalysisConsumer(), clang::ExecuteCompilerInvocation(), and clang::ento::ModelInjector::ModelInjector(). Definition at line 476 of file CompilerInstance.h. Referenced by createModuleManager(), createSema(), clang::ASTMergeAction::ExecuteAction(), setASTConsumer(), and setASTContext(). Definition at line 453 of file CompilerInstance.h. Referenced by clang::FrontendAction::BeginSourceFile(), createASTReader(), createModuleManager(), createPCHExternalASTSource(), createSema(), clang::VerifyPCHAction::ExecuteAction(), clang::ASTMergeAction::ExecuteAction(), makeStandaloneDiagnostic(), clang::ento::ModelInjector::ModelInjector(), setASTConsumer(), and setASTContext(). Definition at line 373 of file CompilerInstance.h. Referenced by createASTContext(), createPreprocessor(), and ExecuteAction(). Definition at line 551 of file CompilerInstance.h. Definition at line 261 of file CompilerInstance.h. Referenced by clang::FrontendAction::BeginSourceFile(), clang::RewriteObjCAction::CreateASTConsumer(), clang::CodeGenAction::CreateASTConsumer(), createDiagnostics(), clang::CodeGenAction::ExecuteAction(), and ExecuteAction(). Definition at line 264 of file CompilerInstance.h. Definition at line 268 of file CompilerInstance.h. Referenced by createPreprocessor(), and InitializeSourceManager(). Definition at line 271 of file CompilerInstance.h. Definition at line 349 of file CompilerInstance.h. Referenced by clang::FixItRecompile::BeginInvocation(), clang::FrontendAction::BeginSourceFile(), compileModuleImpl(), clang::FrontendAction::EndSourceFile(), clang::ento::ModelInjector::ModelInjector(), and clang::RewriteIncludesAction::RewriteImportsListener::visitModuleFile(). Definition at line 275 of file CompilerInstance.h. Referenced by clang::RewriteObjCAction::CreateASTConsumer(), clang::createChainedIncludesSource(), createDiagnostics(), and clang::ASTMergeAction::ExecuteAction(). Definition at line 278 of file CompilerInstance.h. Definition at line 341 of file CompilerInstance.h. Referenced by clang::arcmt::CheckAction::BeginInvocation(), clang::arcmt::ModifyAction::BeginInvocation(), clang::arcmt::MigrateSourceAction::BeginInvocation(), clang::arcmt::MigrateAction::BeginInvocation(), clang::FixItRecompile::BeginInvocation(), clang::arcmt::ObjCMigrateAction::BeginInvocation(), clang::FrontendAction::BeginSourceFile(), clang::FixItAction::BeginSourceFileAction(), clearOutputFiles(), compileAndLoadModule(), compileModuleImpl(), clang::GeneratePCHAction::ComputeASTConsumerArguments(), clang::RewriteObjCAction::CreateASTConsumer(), clang::CodeGenAction::CreateASTConsumer(), clang::GenerateModuleAction::CreateASTConsumer(), createFileManager(), clang::CreateFrontendBaseAction(), createOutputFile(), createPreprocessor(), createSourceManager(), clang::CodeGenAction::ExecuteAction(), clang::ASTMergeAction::ExecuteAction(), ExecuteAction(), clang::ExecuteCompilerInvocation(), clang::FrontendAction::getCurrentModule(), getInputBufferForModule(), InitializeSourceManager(), loadModule(), loadModuleFromSource(), prepareToBuildModule(), and clang::FrontendAction::shouldEraseOutputFiles(). Definition at line 393 of file CompilerInstance.h. Referenced by clang::FrontendAction::BeginSourceFile(), collectIncludePCH(), compileModuleImpl(), clang::arcmt::MigrateSourceAction::CreateASTConsumer(), clang::CodeGenAction::CreateASTConsumer(), clang::arcmt::ObjCMigrateAction::CreateASTConsumer(), clang::FrontendAction::Execute(), clang::DumpModuleInfoAction::ExecuteAction(), clang::ASTMergeAction::ExecuteAction(), clang::PrintPreambleAction::ExecuteAction(), getInputBufferForModule(), InitializeSourceManager(), loadGlobalModuleIndex(), clang::ento::ModelInjector::ModelInjector(), prepareToBuildModule(), and clang::RewriteIncludesAction::RewriteImportsListener::visitModuleFile(). Definition at line 282 of file CompilerInstance.h. Referenced by clang::FrontendAction::BeginSourceFile(), createFileManager(), clang::ASTMergeAction::ExecuteAction(), and clang::cross_tu::CrossTranslationUnitContext::loadExternalAST(). Definition at line 285 of file CompilerInstance.h. Definition at line 289 of file CompilerInstance.h. Referenced by clang::FixItRecompile::BeginInvocation(), clang::FrontendAction::BeginSourceFile(), clang::FixItAction::BeginSourceFileAction(), compileModuleImpl(), clang::GeneratePCHAction::ComputeASTConsumerArguments(), clang::ento::CreateAnalysisConsumer(), clang::arcmt::MigrateSourceAction::CreateASTConsumer(), clang::ASTPrintAction::CreateASTConsumer(), clang::ASTDumpAction::CreateASTConsumer(), clang::CodeGenAction::CreateASTConsumer(), clang::GeneratePCHAction::CreateASTConsumer(), clang::GenerateModuleAction::CreateASTConsumer(), clang::createChainedIncludesSource(), createCodeCompletionConsumer(), createDefaultOutputFile(), clang::CreateFrontendAction(), clang::CreateFrontendBaseAction(), createModuleManager(), clang::GeneratePCHAction::CreateOutputFile(), createPCHExternalASTSource(), createPreprocessor(), clang::FrontendAction::EndSourceFile(), clang::DumpModuleInfoAction::ExecuteAction(), clang::VerifyPCHAction::ExecuteAction(), ExecuteAction(), clang::ASTFrontendAction::ExecuteAction(), clang::ExecuteCompilerInvocation(), clang::FrontendAction::getCurrentModule(), InitializeSourceManager(), prepareToBuildModule(), and shouldBuildGlobalModuleIndex(). Definition at line 292 of file CompilerInstance.h. Definition at line 567 of file CompilerInstance.h. References Filename, Line, and clang::Preamble. Definition at line 296 of file CompilerInstance.h. Referenced by clang::DumpModuleInfoAction::BeginInvocation(), clang::FrontendAction::BeginSourceFile(), collectVFSEntries(), clang::GeneratePCHAction::ComputeASTConsumerArguments(), clang::CodeGenAction::CreateASTConsumer(), createModuleManager(), createPCHExternalASTSource(), createPreprocessor(), clang::CodeGenAction::ExecuteAction(), clang::VerifyPCHAction::ExecuteAction(), ExecuteAction(), and getSpecificModuleCachePath(). Definition at line 299 of file CompilerInstance.h. Definition at line 302 of file CompilerInstance.h. Definition at line 236 of file CompilerInstance.h. Referenced by clang::arcmt::CheckAction::BeginInvocation(), clang::arcmt::ModifyAction::BeginInvocation(), clang::arcmt::MigrateAction::BeginInvocation(), compileModuleImpl(), clang::createChainedIncludesSource(), createFileManager(), ExecuteAction(), getSpecificModuleCachePath(), makeStandaloneDiagnostic(), clang::ento::ModelInjector::ModelInjector(), and clang::RewriteIncludesAction::RewriteImportsListener::visitModuleFile(). Definition at line 306 of file CompilerInstance.h. Referenced by clang::FixItRecompile::BeginInvocation(), clang::FrontendAction::BeginSourceFile(), clang::FixItAction::BeginSourceFileAction(), clang::GeneratePCHAction::BeginSourceFileAction(), compileModuleImpl(), clang::RewriteObjCAction::CreateASTConsumer(), clang::CodeGenAction::CreateASTConsumer(), clang::GeneratePCHAction::CreateASTConsumer(), clang::GenerateModuleAction::CreateASTConsumer(), createASTContext(), createPreprocessor(), clang::FrontendAction::EndSourceFile(), clang::CodeGenAction::ExecuteAction(), ExecuteAction(), clang::PrintPreambleAction::ExecuteAction(), clang::ExecuteCompilerInvocation(), clang::FrontendAction::getCurrentModule(), getInputBufferForModule(), loadModule(), prepareToBuildModule(), and ReadOriginalFileName(). Definition at line 309 of file CompilerInstance.h. Definition at line 803 of file CompilerInstance.h. Referenced by compileModuleImpl(), clang::GeneratePCHAction::CreateASTConsumer(), clang::GenerateModuleAction::CreateASTConsumer(), createASTReader(), createModuleManager(), createPCHExternalASTSource(), clang::VerifyPCHAction::ExecuteAction(), and clang::RewriteIncludesAction::RewriteImportsListener::visitModuleFile(). Definition at line 139 of file CompilerInstance.cpp. Definition at line 129 of file CompilerInstance.cpp. Referenced by clang::FrontendAction::BeginSourceFile(), clang::RewriteIncludesAction::BeginSourceFileAction(), compileAndLoadModule(), makeStandaloneDiagnostic(), and clang::RewriteIncludesAction::RewriteImportsListener::visitModuleFile(). Definition at line 513 of file CompilerInstance.h. Referenced by clang::arcmt::CheckAction::BeginInvocation(), clang::arcmt::ModifyAction::BeginInvocation(), clang::arcmt::MigrateAction::BeginInvocation(), compileModuleImpl(), clang::createChainedIncludesSource(), clang::cross_tu::CrossTranslationUnitContext::loadExternalAST(), clang::ento::ModelInjector::ModelInjector(), and clang::RewriteIncludesAction::RewriteImportsListener::visitModuleFile(). Definition at line 533 of file CompilerInstance.h. Referenced by clang::FrontendAction::BeginSourceFile(), collectIncludePCH(), createASTReader(), createModuleManager(), createPCHExternalASTSource(), createPreprocessor(), clang::FrontendAction::Execute(), clang::VerifyPCHAction::ExecuteAction(), clang::ASTMergeAction::ExecuteAction(), and loadGlobalModuleIndex(). Return the appropriate PCHContainerWriter depending on the current CodeGenOptions. Definition at line 519 of file CompilerInstance.h. Referenced by clang::GeneratePCHAction::CreateASTConsumer(), and clang::GenerateModuleAction::CreateASTConsumer(). Definition at line 433 of file CompilerInstance.h. Referenced by AddTopLevelDeclarationToHash(), clang::FrontendAction::BeginSourceFile(), collectIncludePCH(), compileModuleImpl(), clang::ento::CreateAnalysisConsumer(), clang::HTMLPrintAction::CreateASTConsumer(), clang::arcmt::MigrateSourceAction::CreateASTConsumer(), clang::CodeGenAction::CreateASTConsumer(), clang::arcmt::ObjCMigrateAction::CreateASTConsumer(), clang::GeneratePCHAction::CreateASTConsumer(), clang::GenerateModuleAction::CreateASTConsumer(), createASTContext(), createASTReader(), createCodeCompletionConsumer(), createModuleManager(), createPCHExternalASTSource(), createSema(), clang::FrontendAction::EndSourceFile(), clang::FrontendAction::Execute(), clang::RewriteMacrosAction::ExecuteAction(), clang::RewriteTestAction::ExecuteAction(), clang::RewriteIncludesAction::ExecuteAction(), clang::DumpModuleInfoAction::ExecuteAction(), clang::VerifyPCHAction::ExecuteAction(), clang::PrintPreambleAction::ExecuteAction(), clang::DumpRawTokensAction::ExecuteAction(), clang::DumpTokensAction::ExecuteAction(), clang::PreprocessOnlyAction::ExecuteAction(), clang::PrintPreprocessedAction::ExecuteAction(), clang::FrontendAction::getCurrentModule(), clang::arcmt::getFileRemappings(), getInputBufferForModule(), InitializeSourceManager(), loadGlobalModuleIndex(), loadModuleFile(), loadModuleMapForModuleBuild(), prepareToBuildModule(), and ReadOriginalFileName(). Definition at line 313 of file CompilerInstance.h. Referenced by clang::FixItRecompile::BeginInvocation(), clang::FrontendAction::BeginSourceFile(), collectIncludePCH(), clang::CodeGenAction::CreateASTConsumer(), clang::GeneratePCHAction::CreateASTConsumer(), clang::createChainedIncludesSource(), createModuleManager(), createPCHExternalASTSource(), createPreprocessor(), clang::VerifyPCHAction::ExecuteAction(), and loadModule(). Definition at line 316 of file CompilerInstance.h. Definition at line 320 of file CompilerInstance.h. Referenced by clang::RewriteIncludesAction::BeginSourceFileAction(), clang::CreateFrontendBaseAction(), createPreprocessor(), clang::RewriteIncludesAction::ExecuteAction(), and clang::PrintPreprocessedAction::ExecuteAction(). Definition at line 323 of file CompilerInstance.h. Definition at line 438 of file CompilerInstance.h. Referenced by makeStandaloneDiagnostic(), and clang::ento::ModelInjector::ModelInjector(). Definition at line 494 of file CompilerInstance.h. Referenced by createModuleManager(), clang::TemplightDumpAction::ExecuteAction(), and clang::ASTFrontendAction::ExecuteAction(). Definition at line 413 of file CompilerInstance.h. Referenced by clang::FixItRecompile::BeginInvocation(), clang::FrontendAction::BeginSourceFile(), clang::FixItAction::BeginSourceFileAction(), compileModuleImpl(), clang::arcmt::MigrateSourceAction::CreateASTConsumer(), clang::arcmt::ObjCMigrateAction::CreateASTConsumer(), createModuleManager(), createPreprocessor(), clang::FrontendAction::EndSourceFile(), clang::CodeGenAction::ExecuteAction(), clang::PrintPreprocessedAction::ExecuteAction(), InitializeSourceManager(), loadModule(), loadModuleMapForModuleBuild(), clang::ento::ModelInjector::ModelInjector(), prepareToBuildModule(), and ReadOriginalFileName(). Definition at line 458 of file CompilerInstance.cpp. References clang::HeaderSearchOptions::DisableModuleHash, getHeaderSearchOpts(), getInvocation(), and clang::CompilerInvocation::getModuleHash(). Referenced by clang::FrontendAction::BeginSourceFile(), and createPreprocessor(). Definition at line 361 of file CompilerInstance.h. Referenced by createASTContext(), createPreprocessor(), clang::CodeGenAction::ExecuteAction(), ExecuteAction(), makeStandaloneDiagnostic(), and prepareToBuildModule(). Definition at line 327 of file CompilerInstance.h. Referenced by clang::FrontendAction::BeginSourceFile(), clang::CodeGenAction::CreateASTConsumer(), clang::CodeGenAction::ExecuteAction(), and ExecuteAction(). Definition at line 330 of file CompilerInstance.h. Definition at line 382 of file CompilerInstance.h. Definition at line 789 of file CompilerInstance.h. Definition at line 474 of file CompilerInstance.h. Definition at line 451 of file CompilerInstance.h. Referenced by clang::FrontendAction::BeginSourceFile(), createModuleManager(), and makeStandaloneDiagnostic(). Definition at line 549 of file CompilerInstance.h. Referenced by clang::ASTFrontendAction::ExecuteAction(), and clang::FrontendAction::getCurrentModule(). Definition at line 338 of file CompilerInstance.h. Referenced by ExecuteAction(), and clang::tooling::FrontendActionFactory::runInvocation(). Definition at line 390 of file CompilerInstance.h. Referenced by clang::FrontendAction::BeginSourceFile(), clang::FrontendAction::Execute(), and loadGlobalModuleIndex(). Definition at line 565 of file CompilerInstance.h. Definition at line 234 of file CompilerInstance.h. Definition at line 430 of file CompilerInstance.h. Referenced by clang::FrontendAction::EndSourceFile(), clang::FrontendAction::Execute(), clang::ASTFrontendAction::ExecuteAction(), InitializeSourceManager(), loadGlobalModuleIndex(), and makeStandaloneDiagnostic(). Definition at line 492 of file CompilerInstance.h. Referenced by createModuleManager(), and clang::ASTFrontendAction::ExecuteAction(). Definition at line 410 of file CompilerInstance.h. Definition at line 359 of file CompilerInstance.h. Referenced by ExecuteAction(), and makeStandaloneDiagnostic(). InitializeSourceManager - Initialize the source manager to set InputFile as the main file. Definition at line 803 of file CompilerInstance.cpp. References getDependencyOutputOpts(), getDiagnostics(), getFileManager(), getFrontendOpts(), getPreprocessor(), getSourceManager(), and hasPreprocessor(). Definition at line 811 of file CompilerInstance.cpp. References clang::SrcMgr::C_System, clang::SrcMgr::C_System_ModuleMap, clang::SrcMgr::C_User, clang::SrcMgr::C_User_ModuleMap, clang::SourceManager::createFileID(), clang::FrontendInputFile::getBuffer(), clang::FileManager::getBufferForFile(), clang::FileManager::getFile(), clang::FrontendInputFile::getFile(), clang::InputKind::getFormat(), clang::FrontendInputFile::getKind(), clang::SourceManager::getMainFileID(), clang::FileManager::getVirtualFile(), clang::FrontendInputFile::isBuffer(), clang::FileEntry::isNamedPipe(), clang::FrontendInputFile::isSystem(), clang::FileID::isValid(), clang::InputKind::ModuleMap, clang::SourceManager::overrideFileContents(), clang::DiagnosticsEngine::Report(), clang::SourceManager::setMainFileID(), and clang::SourceManager::Unowned. Load, create, or return global module. This function returns an existing global module index, if one had already been loaded or created, or loads one if it exists, or creates one if it doesn't exist. Also, importantly, if the index doesn't cover all the modules in the module map, it will be update to do so here, because of its use in searching for needed module imports and associated fixit messages. TriggerLoc The location for what triggered the load. Returns null if load failed. Definition at line 2030 of file CompilerInstance.cpp. References clang::ModuleLoader::buildingModule(), createModuleManager(), clang::Module::DefinitionLoc, clang::Module::getASTFile(), getFileManager(), clang::Preprocessor::getHeaderSearchInfo(), clang::HeaderSearch::getModuleMap(), getPCHContainerReader(), getPreprocessor(), hasFileManager(), hasPreprocessor(), clang::Module::Hidden, loadModule(), clang::ModuleMap::module_begin(), clang::ModuleMap::module_end(), clang::Module::Name, shouldBuildGlobalModuleIndex(), and clang::GlobalModuleIndex::writeIndex(). Attempt to load the given module. This routine attempts to load the module described by the given parameters. ImportLoc The location of the 'import' keyword. Path The identifiers (and their locations) of the module "path", e.g., "std.vector" would be split into "std" and "vector". Visibility The visibility provided for the names in the loaded module. IsInclusionDirective Indicates that this module is being loaded implicitly, due to the presence of an inclusion directive. Otherwise, it is being loaded due to an import declaration. If successful, returns the loaded module. Otherwise, returns NULL to indicate that the module could not be loaded. Definition at line 1595 of file CompilerInstance.cpp. References clang::ASTReader::ARR_ConfigurationMismatch, clang::ASTReader::ARR_Missing, clang::ASTReader::ARR_OutOfDate, compileAndLoadModule(), clang::ModuleLoadResult::ConfigMismatch, clang::ASTReader::ConfigurationMismatch, createModuleManager(), clang::FixItHint::CreateReplacement(), clang::LangOptions::CurrentModule, clang::Module::DefinitionLoc, clang::PreprocessorOptions::FailedModules, clang::ASTReader::Failure, clang::Module::findSubmodule(), clang::Module::getASTFile(), getDiagnostics(), clang::Module::getFullModuleName(), getLangOpts(), clang::SourceManager::getModuleBuildStack(), getPreprocessorOpts(), getSourceManager(), clang::Module::getTopLevelModule(), clang::ASTReader::HadErrors, clang::ModuleLoader::HadFatalFailure, clang::Module::HasIncompatibleModuleFile, clang::DiagnosticsEngine::isIgnored(), clang::SourceLocation::isValid(), clang::ASTReader::Missing, clang::serialization::MK_ExplicitModule, clang::serialization::MK_ImplicitModule, clang::serialization::MK_PrebuiltModule, clang::Module::Name, clang::ASTReader::OutOfDate, clang::HeaderSearchOptions::PrebuiltModuleFiles, clang::HeaderSearchOptions::PrebuiltModulePaths, clang::DiagnosticsEngine::Report(), clang::ASTReader::Success, and clang::ASTReader::VersionMismatch. Definition at line 1498 of file CompilerInstance.cpp. References clang::ModuleMap::findModule(), clang::Preprocessor::getHeaderSearchInfo(), clang::Preprocessor::getIdentifierInfo(), clang::HeaderSearch::getModuleMap(), getPreprocessor(), and clang::Module::HasIncompatibleModuleFile. Attempt to load the given module from the specified source buffer. Does not make any submodule visible; for that, use loadModule or makeModuleVisible. Loc The location at which the module was loaded. ModuleName The name of the module to build. Source The source of the module: a (preprocessed) module map. Definition at line 1966 of file CompilerInstance.cpp. References clang::C, compileModuleImpl(), getDiagnostics(), getLanguageFromOptions(), clang::isAlphanumeric(), clang::InputKind::ModuleMap, clang::DiagnosticsEngine::Report(), and llvm::str(). Check global module index for missing imports. Name The symbol name to look for. Returns true if any modules with that symbol found. Definition at line 2089 of file CompilerInstance.cpp. References clang::ModuleLoader::buildingModule(), loadGlobalModuleIndex(), and clang::GlobalModuleIndex::lookupIdentifier(). Make the given module visible. Definition at line 2019 of file CompilerInstance.cpp. Definition at line 458 of file CompilerInstance.h. Definition at line 398 of file CompilerInstance.h. Definition at line 440 of file CompilerInstance.h. Definition at line 2112 of file CompilerInstance.cpp. Definition at line 418 of file CompilerInstance.h. setASTConsumer - Replace the current AST consumer; the compiler instance takes ownership of Value. Definition at line 114 of file CompilerInstance.cpp. References getASTConsumer(), getASTContext(), and clang::ASTConsumer::Initialize(). setASTContext - Replace the current AST context. Definition at line 103 of file CompilerInstance.cpp. Referenced by clang::FrontendAction::BeginSourceFile(), createASTContext(), and clang::FrontendAction::EndSourceFile(). Definition at line 89 of file CompilerInstance.cpp. Set the flag indicating whether we should (re)build the global module index. Definition at line 249 of file CompilerInstance.h. setCodeCompletionConsumer - Replace the current code completion consumer; the compiler instance takes ownership of Value. Definition at line 121 of file CompilerInstance.cpp. setDiagnostics - Replace the current diagnostics engine. Definition at line 84 of file CompilerInstance.cpp. Definition at line 2114 of file CompilerInstance.cpp. Replace the current file manager and virtual file system. Definition at line 91 of file CompilerInstance.cpp. Referenced by clang::FixItRecompile::BeginInvocation(), clang::FrontendAction::BeginSourceFile(), clang::FrontendAction::EndSourceFile(), makeStandaloneDiagnostic(), and clang::tooling::FrontendActionFactory::runInvocation(). setInvocation - Replace the current invocation. Definition at line 72 of file CompilerInstance.cpp. Referenced by clang::ento::ModelInjector::ModelInjector(), clang::tooling::FrontendActionFactory::runInvocation(), and clang::RewriteIncludesAction::RewriteImportsListener::visitModuleFile(). Definition at line 143 of file CompilerInstance.cpp. Definition at line 132 of file CompilerInstance.cpp. Definition at line 766 of file CompilerInstance.h. Definition at line 99 of file CompilerInstance.cpp. Replace the current Sema; the compiler instance takes ownership of S.
Definition at line 110 of file CompilerInstance.cpp. setSourceManager - Replace the current source manager. Definition at line 95 of file CompilerInstance.cpp. Referenced by clang::FixItRecompile::BeginInvocation(), clang::FrontendAction::BeginSourceFile(), clang::FrontendAction::EndSourceFile(), and makeStandaloneDiagnostic(). Definition at line 88 of file CompilerInstance.cpp. Indicates whether we should (re)build the global module index. Definition at line 77 of file CompilerInstance.cpp. Referenced by clang::FrontendAction::Execute(), and loadGlobalModuleIndex(). takeASTConsumer - Remove the current AST consumer and give ownership to the caller. Definition at line 483 of file CompilerInstance.h. Referenced by clang::FrontendAction::EndSourceFile(), and makeStandaloneDiagnostic(). Definition at line 770 of file CompilerInstance.h. Definition at line 125 of file CompilerInstance.cpp. Referenced by makeStandaloneDiagnostic(), and resetAndLeakSema().